If you are having hard time to make your kids eat veggies, one is mask the veggies and turn it into something they love. Before, I turned puso ng saging or bananablossom into a burger (you can get the recipe at Chemist Dad), now here is another suggestion. Turn it into lumpiang shanghai and siomai. To add another twist, the mixture is prepared the longganisa way. Since the lumpia wrapper is not enough for the prepared mixture, I turn the remaining mixture into siomai. In a bowl, mix all the ingredients. Wrap about 1 tablespoon of mixture using lumpia or siomai wrapper. For the lumpia: Deep fry until the wrapper turns golden brown. For the siomai: Bring water into rolling boil. Steam prepare siomai for about 15-20 minutes. Serve with whatever dip you prefer. That really looks like a very tasty snack for the kids.. I'm sure Matt enjoyed eating it. I love both of this! 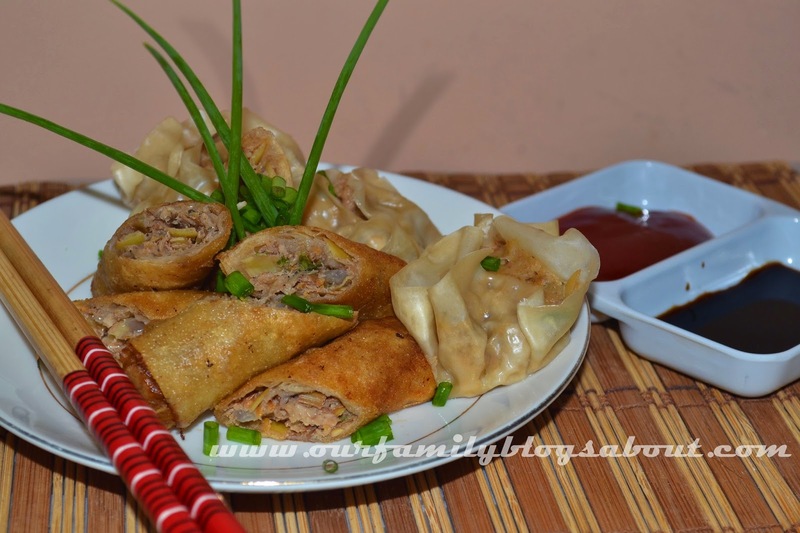 But I prefer lumpia over siomai and the plating looks good too!